Part one of our pension series looked at why a huge pension storm could be forming in the UK. Like most 20-year-olds I didn’t have any understanding of the financial sphere; investing, budgeting and pensions were a foreign language to me. Following an internship overseas, a spark was planted in my mind to get educated in the world of personal finance, then like most…I did nothing, until three years later when I was introduced to ‘Rich Dad, Poor Dad’ and the spark got ignited. I started reading books on the subject like a deranged madman during which I discovered the FIRE (Financially Independent Retire Early) movement, these people were doing what I thought was impossible…retiring decades before the norm, often in their 40s or 30s. This concept really entered my reality when I later met several who’d achieved this and even interviewed a few on my blog (such as Robin, Peter and Siam). The first step it seems is just believing retiring early (or at all) is possible. It sounds extremely ‘new age’ but it really does require a shift in your conscious. Meeting people who’d done it and understanding what I’m about to show you really brought it alive to me. You can retire when you have 25 X your annual expenses invested. This drives home the compounding difference cutting back and investing the difference can have on increasing your pension. Save 10% of your after-tax income (typically shared by experts as a good aim), and it’ll take 51 years of working to retire, 51! Increase it to 50% and it drops dramatically to just 17 years, 80%? Work for just 5.5 years. Can you see why it’s not just how much you earn, but how much you keep? The second part of the equation (earning more) must then come after the first and be achieved through upskilling yourself to command a higher salary or by taking on side hustles (such as Matched Betting or AirB&Bing out rooms). How do I get going with a Pension, what’re the first steps to take? To best answer this section I’ve brought in sponsors PensionBee, PensionBee allows you to combine multiple pension pots into a single online plan, add contributions and make withdrawals. “Typically sent by post once per year (although accessible online or via calling), your pension provider can tell you everything you need to know about the health of your pension, including what type of pension you have and how your money’s being invested. It will also say how much you have saved, and what your pension pot is expected to be worth when you reach retirement age. “One of the biggest barriers people face when starting a pension is knowing how much to save. It’s genuinely difficult to predict exactly how your circumstances will change and what level of income you’ll need for a comfortable retirement – especially if it’s a long way off. Many people aim for a retirement income that’s two-thirds of their current salary. For example, if your annual salary is currently £30,000, then £20,000 per year would, in theory, give you a reasonable retirement income. 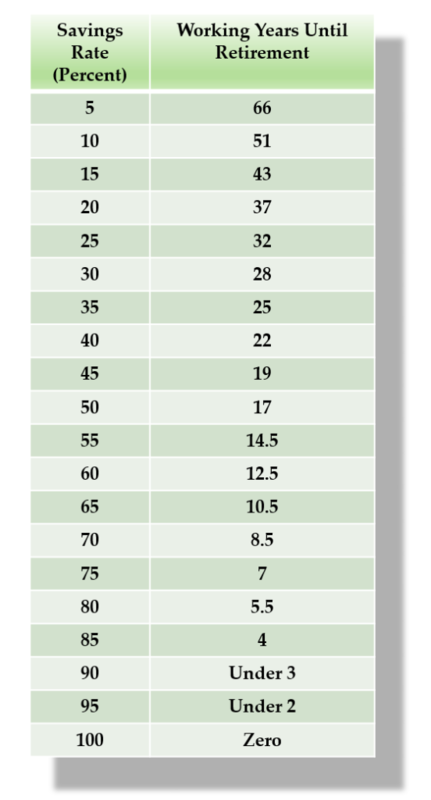 Pension calculators can be a big help as they can estimate your projected retirement income based on factors like how much you’re saving, and how many years you have left until retirement. 3. Max out free money! “The easiest way to contribute to a pension is to join your workplace scheme, so you can benefit from the contributions your employer is required to make by law. Most UK taxpayers get tax relief on their pension contributions, which effectively means that the government adds money to your pension pot for free – but a lot of people don’t know about this. Basic rate taxpayers get a 25% tax top up, meaning HMRC adds £25 for every £100 you pay into your pension. So the more you pay in, the more the government pays in too. Also, if you have the option to be part of a workplace pension scheme, it’s a no-brainer to join. Since the introduction of Auto Enrolment, it’s a legal obligation for all employers to offer a workplace pension for eligible staff (who are at least 22 years of age, working in the UK and earning more than £10,000). Until April 2019 employees have to pay in 3% of their earnings, and employers must contribute 2%. This is rising to 5% for employees and 3% for employers later this year. “The uncomfortable truth is that very few of us are saving enough to have an adequate income in retirement so small changes in behavior can go a long way. Cutting back on your morning Starbucks once or twice a week, bringing a packed lunch to work sometimes or shopping around for the best deals on your utility bills, will save you money that you could put into your pension. The younger you are the longer you’ll have to save, but no one can afford to be complacent. 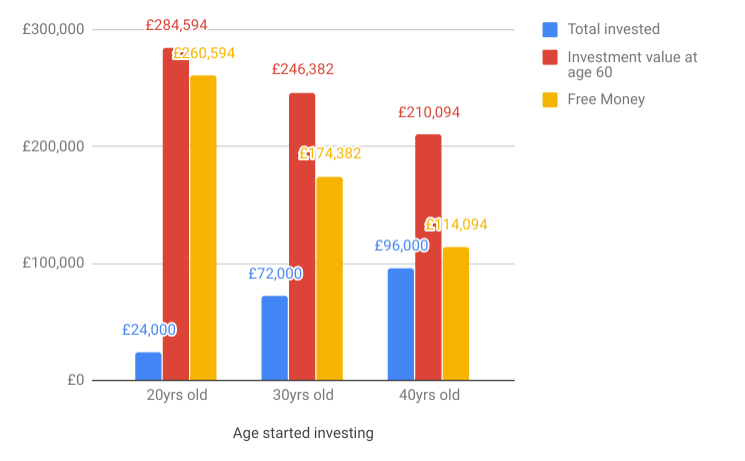 Getting into the habit of saving a small portion of your income into a pension from a young age could have a significant impact on your savings by the time you retire. Thanks again to PensionBee for the above Q&A! Support them by checking out their website to discover how they’re making pensions simple for everyone. What small changes can you make to increase your pension? It then makes sense to invest heavily into a pension at a young age, to maximize the power of compound interest. As covered in my post on expected value between 1915 and 2014 after taking into account inflation equities outperformed Bonds by a factor of 2.7x. 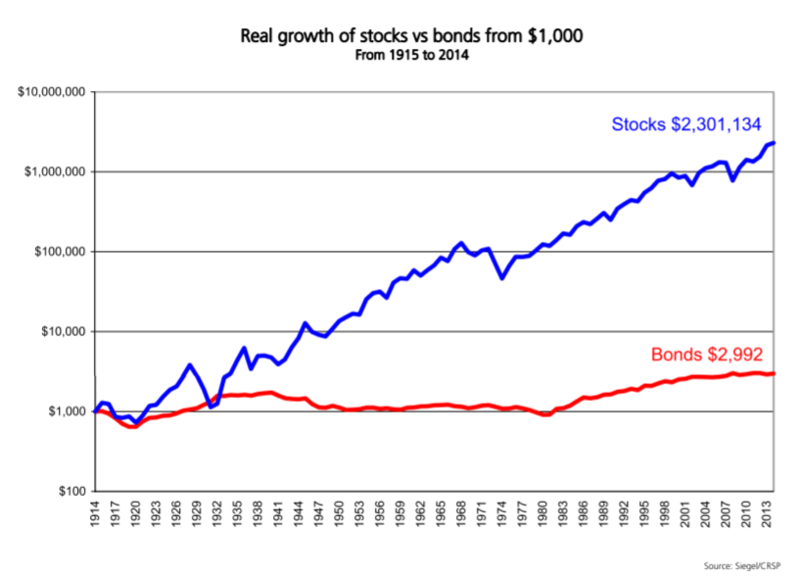 Equities averaged out an annual return of 8.3% whilst Bonds produced a measly 1.1% return. Whilst the blue line for stocks is clearly higher than bonds, if we look more closely we can also see it’s been a much more bumpy ride with many more spikes along the line each representing crashes sometimes beyond 30% at a time. This is why most people choose to have an asset allocation that goes beyond pure equities. However if you can view your performance over a long enough time horizon (which you should with a pension), you’ll discover over the long-run equities have and continue to outperform just about every other asset class. Yet most if not all default workplace pension plans put at least some of your cash into these low volatility (likely low return) assets. This is going to be somewhat controversial for many! But the fact remains government pensions broadly speaking are far, far superior to private pensions. “A nurse aged 25, earning £21,692 typically contributes 7.1pc of salary each year to fund their retirement. If they work for 40 years, stay in the same band of earnings throughout and attain 4pc annual increases in pay, they could retire on an annual salary of £45,500 in today’s money. This income is guaranteed by the state and will also increase each year in line with inflation, protecting its value over time. Even if we assume the private pension holding nurse is financially savvy enough to use flexible drawdown, she’d still have an income of almost 60% less in retirement, despite contributing 26% more plus would also be at the mercy of the stock market. Naturally many public sector workers are keen to hang onto their pensions and work hard to achieve them, I’m certainly not saying we should reduce them rather present the opportunity that working for the government for 5-10 years can make a huge difference to your retirement income. In all likelihood what you’re doing now exists in the public sector, whether that’s in admin, marketing or finance. Of course the lighter version of this would be finding an employer who offers a generous pension plan and ensuring your max out their contributions. Right, if you’ve got this far you’re probably hoping my unpopular opinions are well and truly finished with! Unfortunately for you, I have one more…Don’t retire! This doesn’t necessarily mean I’m encouraging you into backbreaking work throughout your twilight years, rather showing even if you a have a very small income the required pension you’ll need to accumulate will be far less. For example, if you need £1,500 to live off and you’re comfortable with a 4% withdrawal rate, you’d need approximately £450,000. Yet if you take on part-time work or start a business and earn just £500 per month you’d then only need to take £1,000 per month from your pot reducing it’s the required size 33% to £300,000. Naturally this may not always be possible but it certainly showcases how you might bridge the gap to retirement if choosing to retire early. But what happens if just before retiring your pension goes bust? Have any changes been made to safeguard pensions? As mentioned in our first post on the pension crisis in a recent study of 6,000 pension schemes, a total of at least 600 are expected to become insolvent and 1 in 6 are at risk of being bailed out by the government created Pension Protection Fund. So what’s the Pension Protection Fund? Founded in 2005 the Pension Protection Fund (PPF) was created as a safeguard if a defined benefit pension fund becomes insolvent. Although as explained by Choose you may still receive a reduction in your benefits if your provider does go bust. Or if in an auto-enrolment scheme that’s a member of the FCA or PRA you’d be protected by the FSCS for up to 90% of the value of the fund or if the money is accessed on retirement and put directly into investments up to £50k per person per provider (SIPP protection is hazier. This is why many individuals consider spreading pension funds across multiple regulated providers. Managed to get through all of the above? (If so, you hero! ), you should now understand the very real reality of being able to retire both at retirement age or even sooner if you so wish, what first steps you may wish to take, changes you can make now which could positively impact your pension and what safeguards are in place.